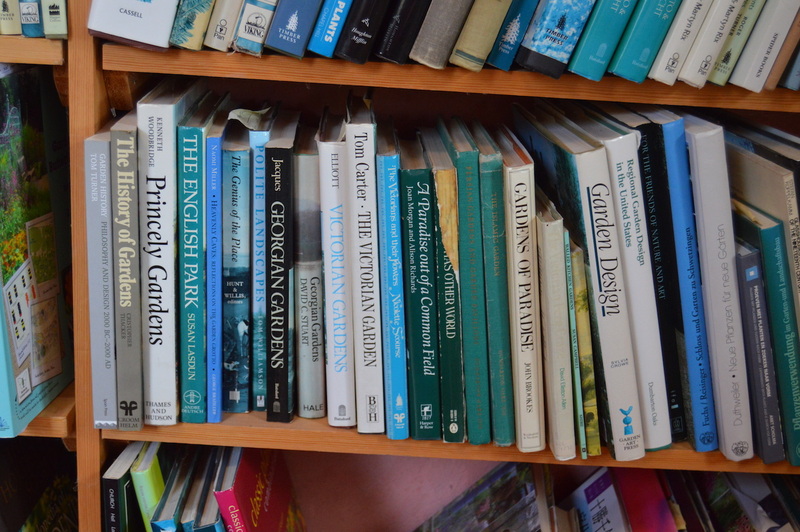 Many gardeners accumulate as many books as they do plant species. Now that we are moving, I face the problem of culling an extensive library that has not had a serious edit since we came to this part of Herefordshire twelve years ago. It is an interesting exercise, sometimes difficult, sometimes painful, but strangely cathartic. And it makes me ponder on the relationship between books, gardening and gardeners. I am sure gardeners write more, read more, and accumulate more books than other hobbyists or semi-professional activities. 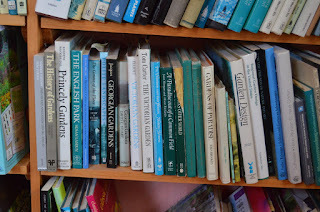 Whereas most beekeepers, dog-breeders, potters and embroiderers probably have a good shelf or two, I don't think they have the multiple-shelf-verging-onto-libraries that many gardeners have. Why is this? Partly I suppose it's because modern gardening has a great deal to do with information. Whereas the traditional core of gardening is a craft set of skills and intuitive abilities, the kind of gardening we indulge in (if hobbyists) or profess (if well.... professionals) is both an art and a science. The former implies constant change and the expression of different and often rival ideas, and the latter the access to hard data. We want to know what Dan Pearson thinks of Veronicastrum virginicum as well as what conditions the Veronicastrum likes to grow in (we do not however have so great an interest in what conditions Dan Pearson likes to live in – there is no 'Hello' magazine of the garden world and I am not sure there is even a functioning gossip column anywhere). Gardeners, and their surprisingly modern colleagues - garden designers, are also great writers and communicators. More so than those of many other fields of human endeavour. There seems to be a strong urge to share and broadcast ideas, knowledge and opinions. Gardening is after all a surprisingly social business. The plantsman always seeks the new, and this is usually gained through some interaction with others: the garden visit, the club meeting, or a nursery fair. Transmitting ideas through print (or its modern digital equivalent) is the next most obvious thing. 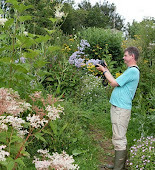 Gardening and garden design are lucky in that they do seem to attract people who actually like writing and do it well. Communicating ideas in print does seem to be a real expectation at a particular point in someone's career. The result is an awful lot of books. The garden book has become a genre in itself, and one that has benefited enormously from all the technological advances in printing technology and colour photography of the last few decades. Inevitably the books accumulate which raises the question – when you are getting ready to move, as we are. What do you keep? and what do you give away or sell second-hand? Books are heavy, gardening books particularly so, because of all that china clay smeared over the paper to create a nice photo-friendly gloss. You don't want to be carting too many of them up and down stairs, into and out of vans, etc. Starting with reference books, I find I'm hardly getting rid of any. The internet has of course become the first point-of-reference but it has huge limitations. 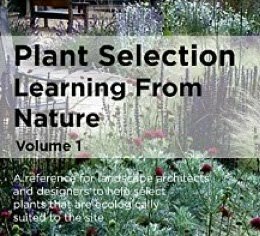 Put in a plant name and very often it is nursery sites which come up; it can be very difficult to find more dispassionate sources, or which tell you anything else about the plant. Websites often just give bald data: height, flowering time, hardiness zone etc., but none of the subjectivity and opinion that gives the text in a book real character, and which is often far more useful in making decisions about whether to grow something or not. Nothing online comes anywhere near the dry wit of Henk Gerritssen in Dream Plants for the Natural Garden or the measured aristocratic snootiness of Graham Stuart Thomas in Perennial Garden Plants, Or, The Modern Florilegium: A Concise Account of Herbaceous Plants, Including Bulbs, for General Garden Use. Such a wonderfully 18th century title. Books about gardens or by designers are a different matter. So many are inevitably in the much sneered-at 'coffee table' category. Publishers also have a high turnover, so the same book concept basically gets published every few years, with different authors and photographers. I shall never forget a commissioning editor saying to me “we haven't done a small gardens book for five years, its time we did another one”, implication of “it's your turn”. The advances in colour repro also mean that what may have looked stunning ten years ago, now looks dated and fuzzy. A lot of writing about design is fuzzy too; there is little real hard analysis of why some designs work and others don't. Designers writing about their own work is often a disaster, they lack the perspective to 'stand outside their own work', to explain how it functions, let alone to look at it critically. As you may have guessed, an awful lot of these end up on the 'go to second hand' pile. How often do I refer back to the carefully ordered copies of The Garden that took up nearly two metres on my shelves? Almost never. Out they go. Hortus? Collective noun for a pile of Hortuses; the classicist might suggest 'Horti', I would suggest a 'smug' - some very good writing in it, and far too nice to put out in the recycling, but always so oddly unchallenging and unquestioning - 'gardens of a golden afternoon' type complacency. So they are on ebay, unless someone wants to come and pick them up. Any offers? In going through books I am reminded of some real gems, classics that stand out and in many cases, deserve to be better known: Andrew Lawson's The Gardener's Book Of Colour, The Inward Garden by Julie Moir Messervy (a psychological approach to garden design, quite unique) Plant-Driven Design by Lauren Springer and Scott Ogden. The common thread being a unique approach, a singular vision, stepping outside the box. When so much in garden publishing is so samey, such individuality is all the more important. At home after some very interesting travelling. I blogged before aboutLatvia and particularly Lithuania. And then Poland, which has a very organised wholesale nursery industry but no real organisation for domestic gardening. Ten days or so at home and then running a workshop in Italy for the Valfredda nursery near Bergamo. Something of a culture shock. Actually that is the first time that I have been asked to lecture or teach south or west of the Alps; something I think which highlights the deep cultural divide in Europe over attitudes to nature and its expression in naturalistic planting. 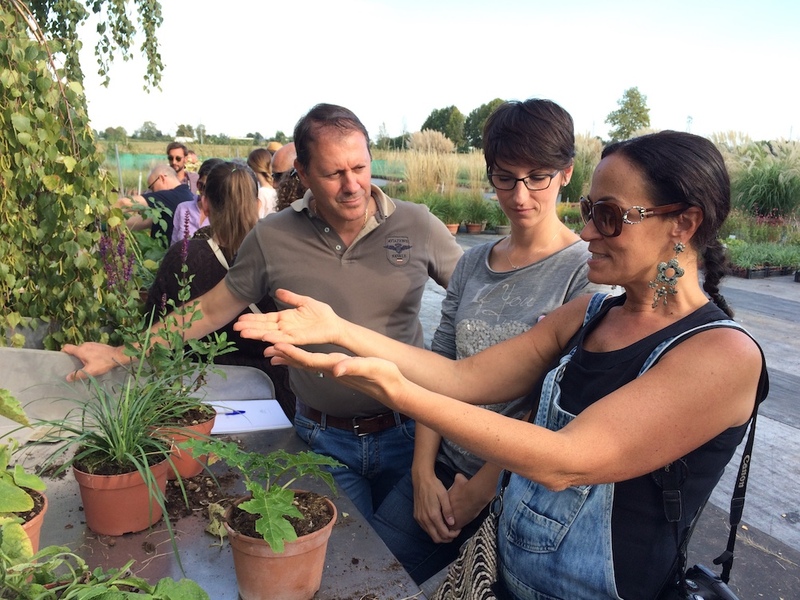 Using perennials in Italy is relatively new. There is a kind of obvious reason for this in that Mediterranean climates, with their dry summers do not favour the growth of plants which need summer moisture, as most perennials do. Just before the lecture started, the presence of two Russian students led me to musing about as a gardener how much more at home I feel in Russia, which may have a very different climate to ours but which at least allows the kind of plants I am familiar with to do very well. Italy of course is at least as divided in gardening terms as it is in every other way: regional cuisines, language and political culture. It is only partly 'Mediterranean' - there are in fact plenty of areas where the water table or moister microclimates, or altitude, allow for good perennial growth. Italian planting design has tended to be very conservative, at least what you see publicly, and garden design generally to be dominated by evergreen shrubs, which after all, are the most ecologically appropriate plants for much of the country. This is however, an incredibly design-focussed culture, so it will be interesting to see what happens to planting design here. Grasses at least seem to be making a big impact in the little exhibition spaces around Bergamo which are set up for the annual conference held here in September. 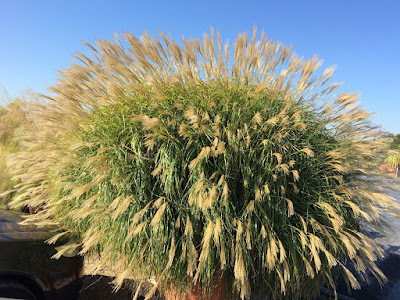 On this subject, it was interesting to see the enormous pots of grasses dotted around the Valfredda nursery – these are used for when the company do exhibitions or trade shows. Some of the miscanthus or panicum grown like this have been in the containers for five to seven years. 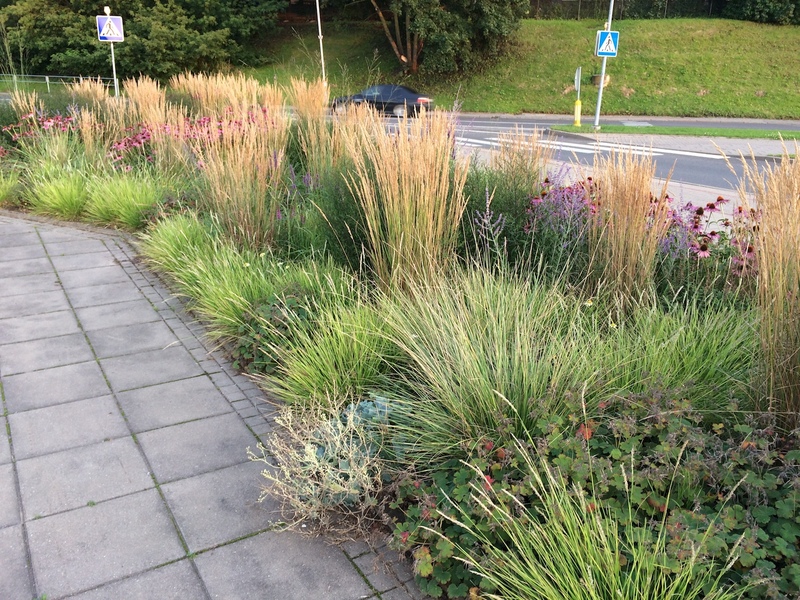 The big divide in European planting design does seem to be around the question of 'is nature beautiful?'. I have always read about this from garden history in terms of an attitude that dates back to the Renaissance, of nature only being beautiful when shaped by the hand of Man (male gender, capital letter), Man being the image of God (ditto!). How much of this is down to Catholicism or Renaissance Humanism I don't know. The other Europe: Germanic/Scandinavian/Slavic/Baltic has a love of nature for its own sake which is quite different; always expressed with an inappropriate definite article, as in “we love the nature”, which further stresses its singularity and importance. I suppose a cultural historian might put this down to a residual paganism which gives untrammelled nature a value which it lacks elsewhere. What about the British? I hear you ask! My immediate answer is to reach up onto the bookshelf to get out Keith Thomas's monumental study Religion and the Decline of Magic of 1971, and think about re-reading it. My gut reaction is that in many ways we are a sort of in-between: like our language (German grammar and core vocabulary, plus Latin vocab) something of a hybrid. The British love nature but we don't really understand what it is, as a cultural landscape of fields and hedges has long since replaced the real thing. Above all we have very little woodland, and indeed sniff at dense forest as somehow 'germanic' and therefore not to be trusted. Basically, I would guess that the great wave of interest in perennials that kicked off in northern Europe in the 1990s is finally reaching southern Europe (see a previous post). 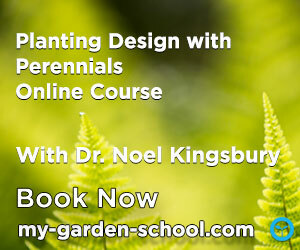 However up and over in eastern Europe the interest in perennials is totally climate-appropriate in the way that it is not so in southern Europe, the idea of naturalistic planting is immediately understood, and – crucially, the economies of most of these countries are now at a level whereby there is, increasingly, money for ornamental private gardens and quality public planting. Some of the most large-scale and best work seems to be happening in Russia, thanks to Anna Andreyeva. Lithuania and Latvia show great promise, as I have flagged up before. The Italian nursery I worked with – Valfredda, and the nurseries emerging in eastern Europe (which mostly seem to be in Poland) currently offer a very similar range of perennials to what we might expect in Britain or Holland. There is a great danger that a successful roll out of these, especially in public places, might lead to a boredom factor kicking in. What is currently lacking appears to be R&D – developing new varieties. 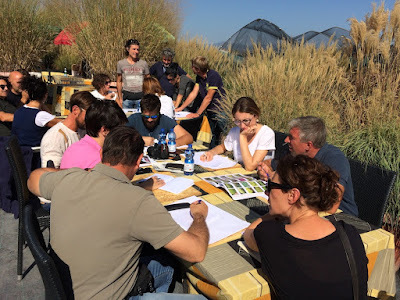 New cultivars and hybrids developed which are climate-appropriate will enable these emerging perennial markets to improve their sustainability and to develop local character. More important still will be collection from the wild. Italy has pretty good biodiversity, as do Spain and Portugal, and the geographical and climatic complexity of this whole region means there must be plenty of garden-worthy species awaiting discovery, or distinct forms of already established species. Eastern Europe can, in theory call on the vastness of the Eurasian landmass for new hardy species for cultivation. They will need to, as the geography (predominantly flat) and geological history mean that there is little local genetic differentiation amongst plant species, until you get down as far south as Romania and Bulgaria, both still 'off the map' in terms of gardening innovation. There is a problem though, and that is that eastern Europe has so firmly set itself looking westwards, away from the old tyrant to the east, that any thought of going plant hunting in Russia or central Asia is a non-starter. An older generation had Russian as a common language (something the non-Russians could all moan about the Russians in) but a younger one went wholesale for English around 1990 (my wife Jo was involved in training English teachers in Slovakia in the early 1990s). East European botanists and plantspeople may have been forbidden from travelling west but the whole vast Soviet empire was open to them; it was interesting a few weeks ago to hear Janis Ruksans, the Latvian bulb expert, reminisce about looking for bulbs in Soviet central Asia. Much as we are all glad for the political changes there is a sadness in seeing this common scientific culture and language disappear. Also sad to hear about is the personal divide between the western-looking republics and Russia. I once suggested to an east European colleague that she invite a certain Russian landscape architect to speak (incidentally known for their liberal views), I was told a firm “no, we're not ready for that yet”. But she's not going to arrive in a tank! Serious planting hunting and new introductions will almost inevitably depend on Russian plantspeople and nurseries looking east and not just growing western-developed species and cultivars, which they all seem to do at the moment. I haven't heard of any Russian plant hunters yet – I very much look forward to doing so. We would all greatly benefit. As we would from some Italian ones.